Engine block spacer plates were designed to reduce stresses on the liner flange, which could cause it to get cracked. The spacer plate is just a few thousands of an inch thinner than the liner flanges, this ensures the correct liner protrusion and guarantees proper head gasket sealing. A new spacer plate should always be used when overhauling your engine, or whenever the cylinder head is removed. It is an inexpensive assurance that your engine will be sealed properly. 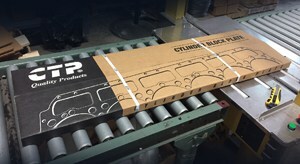 CTP has many new spacer plates available in stock.